severus snape. . Wallpaper and background images in the severus snape club tagged: severus snape harry potter alan rickman proffesor potions master severus. 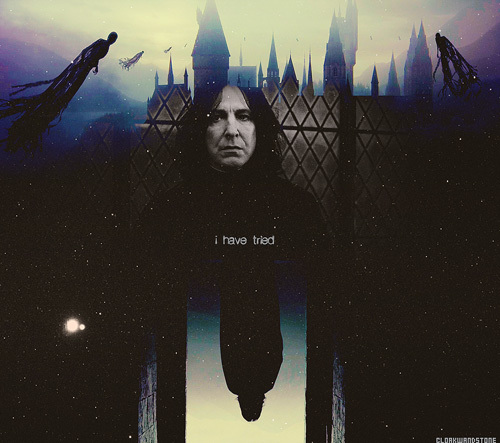 Yes, Severus, you have tried and you have succeeded. Happy Birthday to you ! He did become the one whom everything revolved around and depended on in the end, didn't he? Harry Potter was the 'hero', but our Severus was the one that kept Harry safe and made sure he had the information he needed. Not meaning to belittle Harry and others, but Severus did not get the accolades he deserved for the work he did. So true. I remember reading somewhere that JKR said DH was just as much about Severus as it was about Harry. @karenmiller1972, I agree with you. He didn't get the credit he deserved in the last movie.